Review: Alex Rider the CIA’s one and only teenage agent, is back on another eye opening case in a story called Skeleton Key by Anthony Horowitz. It begins with the main character Alex receiving a seemingly innocent invite by the CIA to the national Wimbledon tournament. He reluctantly agrees for the simple reason that he is told that he is only there to keep an eye on things after a strange break-in, where nothing was taken and no damage occurred there, but it was the night before the opening match. 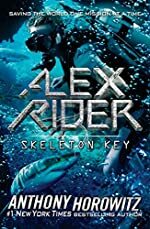 Although the CIA claims there is no danger, a strange security guard that catches Alex’s eye sparks a chain reaction that ends up sending Alex to a far away island called Cayo Esqueleto or Skeleton Key. Two other agents called Troy and Byrne are sent with him to spy on a shady Soviet general called General Sarov. Once again he is told that he is sent there only to act as cover for the two more skilled agents. But, as is his way he uncovers an astonishing secret on the island that if not dealt with will lead to the end of the world. This book is a page turner that will keep you excited the entire story. It’s a story that’s packed with action and so many twists and turns that you won’t ever know what’s coming next. I loved how the plot never ran cold, the story remained interesting and never failed to entertain me. It is told in a second person point of view that gives the reader a new way to experience this spine tingling mystery. The story takes place mostly in the underbelly of the Russian Government on Skeleton Key. It’s a race against time to uncover the secret of what the shady general is hiding and also what Alex himself must do to save the world from harm yet again. As you the reader make your way through the story you will find it switches from person to person while telling the story to give you a wide view of what’s going on throughout the plot. For some people this may erase a sense of suspense that most people look for in a mystery. It explains occurrences that may still be unknown to the main character, leaving you unsurprised or affected at all when these secrets finally reveal themselves to Alex himself. Despite that flaw, this story is an amazing read and is a great story to add to the list of books you have read and enjoyed greatly. I give it four out of five stars and I hope you enjoy this wonderful book. Review written by Alana, Grade 7. Date of review: May 2009.